Migraine treatment is sparse and woefully inadequate, in large part because research is severely underfunded for this disorder despite the fact that 36 million Americans have it. Less than 1/20th of 1% of the National Institutes of Health’s budget is allotted for migraine research. That’s about $16 million; $260 million is the amount that would accurately represent the prevalence and magnitude migraine. The 36 Million Migraine campaign, sponsored by the American Migraine Foundation, seeks to remedy this disparity. If every single American with migraine donated just one dollar, they could raise $36 million for migraine research. If you reached a little deeper in your pockets or encouraged your loved ones to donate for migraine research, just think of the impact we could have. Learn more about the campaign in this brief brochure (PDF), on the AMF’s website, and in the campaign kick-off interview with spokesperson Cindy McCain. Then make your donation of any amount online or by texting 36mill to 50555 to donate $10 today. And encourage your loved ones to kick in a few bucks, too. We desperately need the research! I’m writing this with a level 6 migraine. That’s the most painful a migraine has been for me in the last 11 months. Although I remember the years when the pain didn’t drop below a 7, regularly hit 8 and 9, and was sometimes so severe I tempted fate and rated the pain a 10, I don’t remember what the pain actually felt like. That’s one of the courtesies of the human body — an inability to remember severe pain. So when I rate my pain a 6, I know it hurts a lot, but also recognize that it can be, and has been, much worse. In some ways, level 6 pain is more difficult for me to endure than higher pain levels because I’m still fully present. At level 7 and higher I dissociate; I stop being present with the pain. It’s like I leave my body and numb out for a while. I also become less coherent, sometimes even incoherent. It’s strange to me to be writing a post when I’m at my current maximum pain level. I’m used to associating maximum pain with an inability to think. My thoughts aren’t entirely clear and I’ll likely find mistakes in this post when I read it when the migraine has let up. Still, the words make sense, the sentences are logical. I’m not writing “refrigerator” when I mean “shoe” and I can complete thoughts. That’s partially a function of reduced pain and part that this particular migraine isn’t causing too much cognitive impairment. In fact, this is what I’d call a “pure pain” migraine. My other symptoms are minimal, but my head is screaming. That classic symptom of migraine pain being exacerbated by movement is also on display. Pain is bad and difficult to ignore, but pure pain migraines are much easier for me to put up with than the energy-depleting, mind-draining ones. I’m not sure why I’m sharing a stream of consciousness about this migraine attack, other than it’s interesting to step back and examine the experience. I want to be aware of and remember it so I can go back to being grateful that level 4 is my typical max pain level. I’m also feeling grateful for the efficacy of my current preventives. The migraine attacks are still daily, but a level 4 is nothing compared to even a 6 and is infinitely better than higher levels of pain. Someday, though, the preventives could stop working, a reality that’s never far from my mind. This migraine reminds me what my days could return to. I’m fearful and also furious. Furious that migraine is highly stigmatized and research is massively underfunded, that every preventive medication was created for another illness and efficacy for migraine was an incidental discovery, that only one novel drug class (triptans) have ever been developed to treat migraine. Worldwide, 18% of women and 6% of men have migraine; 36 million people in the US alone have migraine. 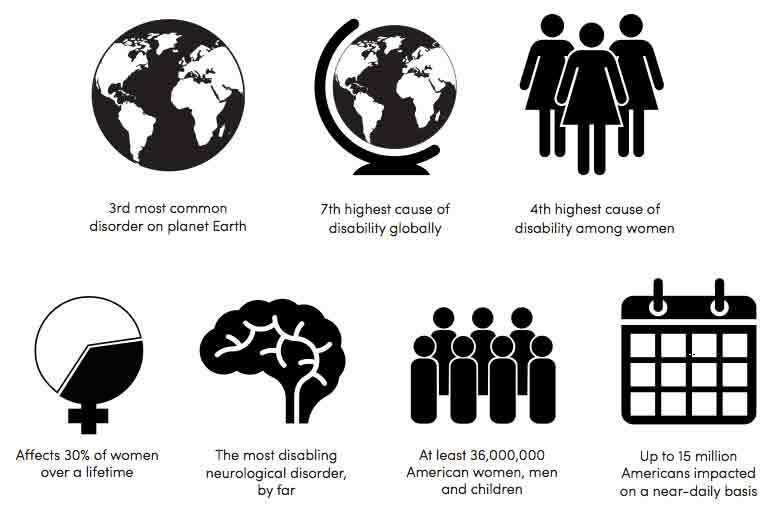 The World Health Organization ranks migraine in the top 20 most disabling illnesses on the planet. Where’s the effective treatment? Where’s the funding to train headache specialists? Where’s the research that will mean my 16-year-old niece isn’t debilitated by migraine 20 years from now? Who decided there’s no value in my quality of life? Survey: What Do Others Think of Your Migraines? From people thinking they’re playing hooky or trying to get attention to being told to get over their “headaches,” every migraineur has stories of appalling comments or behavior from friends, family, teachers, bosses, coworkers, and even strangers. Here’s your chance to tell your story. Complete this short, anonymous survey to help researchers better understand perceptions of migraine. The data gathered will be used to benefit other migraineurs and the health care professionals who work with us, as well as to educate the public at large. Learn more about the survey in this writeup by Dawn Marcus, MD, headache specialist and lead researcher for this study: Research Opportunity: What do others think about your migraine? The survey’s open through the end of April (which is tomorrow! ), so submit your response now. ACT NOW: Tell the FDA Why Migraine Matters! Please, please, please help get migraine included in the FDA’s exciting new patient-focused program by telling them how desperately migraine needs their attention. Inclusion would mean way more time and money spent on — and research and drug development for — this life-altering illness that is typically dismissed as “just a headache.” The deadline is next week, so don’t delay. In this new program, the FDA will choose 20 illnesses and host a meeting on each illness for patients, caregivers, physicians and other interested parties to cover an “in-depth review of the needs related to treatment, the current state of treatments, disease burden, the human side of living with the disease, and other issues of possible relevance to reviewing treatments that may come before the FDA for review,” according to patient advocate Teri Robert. The FDA is currently accepting public comments to help decide which illnesses should be included in the 20. This is where you come in — I beg you to submit a comment highlighting the importance of studying migraine. For most impact, it should be concise, focused and not overly emotional. Comments are due by next Thursday, November 1, so please don’t wait. The FDA is specifically looking for the following criteria when deciding the diseases to include in the program. Please address as many as are relevant to you in your comment. Facts and statistics you may want to include in your comment, which Teri Robert put together. Putting together your comment may take a little time, but it might make the difference in getting migraine recognized as a real and debilitating illness. This will lead to more funding for research into treatments and causes of migraine. Such discoveries could benefit you in the future and will certainly help your children or other young loved ones who have migraine.